The quote above certainly stirs a wave inside your heart. Change is a necessary part of the ecosystem & when we try to change something for good, we indeed spark a revolution. ‘Ok is no longer Ok’ – The Facebook page of Mahindra Navistar Ltd. is indeed creating a revolution on the social network. The main change itself is the pioneering technology of Mahindra Navistar which will change the face of the Indian trucking industry. 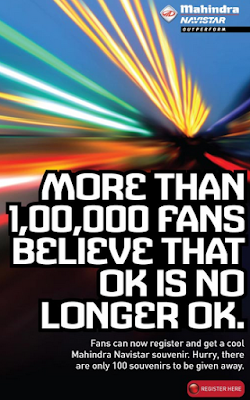 Recently, Ok is no longer Ok – completed 1 lakh fans on Facebook. Celebrating their high amount of support on the social network, the page offered exciting souvenirs to their fans on Facebook. The community on Facebook is quite active in addressing issues which are ‘Not OK’. The much needed change in the society won’t come until we ourselves believe in that change. The Community on Facebook & other platforms such as blog & twitter – provides a great medium to locate & change things around us for the betterment of the society. As Mahindra Navistar trucks change the logistical industry, it incites us to change the face of the society & diminish all ‘Not Ok’ things such as corruption & poverty. Day by Day, the community on Twitter & Facebook is growing in numbers. Not only youth, but middle aged individuals are also turning up to the spirit of Mahindra Navistar. Mahindra Navistar, pioneers in the trucking industry is changing the face of Indian Logistics sector with their state of the art trucks & revolutionary ‘Now Services’. Along with their innovative trucks, Mahindra Navistar steps into a new era of brilliance with the launch of Mahindra Navistar Excellence Awards which recognize and reward Outperformance, Excellence, Innovation and Change Leadership in the Indian Trucking Industry.